Among its many virtues Santa Fe has always been a refuge for dreamers, eccentrics and artists. Some of these magnificent souls bring with them an unmistakable effervescence, a radiant and slightly skewed take on the world that reminds us of what a life of complete freedom, with both its rewards and its costs, looks like. If there were a poster child for Santa Fe artistic eccentricity it would have to be Tommy Macaione (1907-1992). Old time Santa Feans remember Macaione wandering through the city, usually with a few of his beloved dogs with him, painting area landscapes, gardens and street scenes. He was instantly recognizable with his leonine head of hair and bushy beard making him look like a Renaissance artist who just happened to drop into the latter part of the 20th century. We got some insight into Macaione when the author, Robert Wolf, stopped by the gallery a few months ago to talk about his new book, In Search of America. Wolf met Macaione and other Santa Fe artists when he lived here and the new book includes accounts of that period. 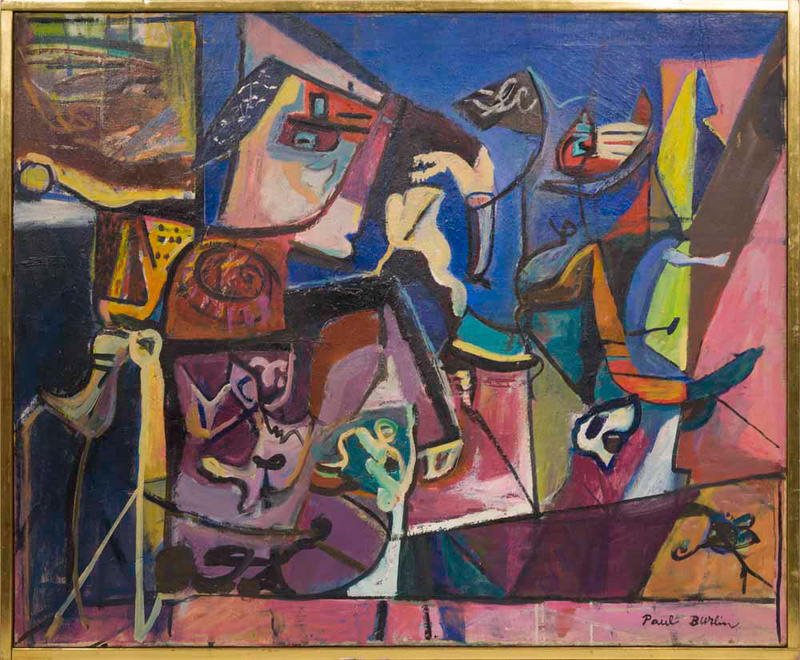 In addition to Macaione, Wolf writes about artists including Alfred Morang, Harold West, Eli Levin and others. We were so interested to hear some of these stories of Santa Fe that we are hosting a book signing for Mr. Wolf this month. In addition to Mr. Wolf’s appearance we’ll be showing some works by artists who appear in the book. The book signing and exhibition will take place Friday, October 16 from 5 to 7 pm at the gallery. From the early 1960s through the early 1970s, I lived on and off in New Mexico. In February 1963, at age nineteen, I left an upper middle-class Connecticut home to rent an uninsulated shack in Duran for $10 a month, and stayed until late March. In 1965, I returned to New Mexico to enroll in St. John’s College. In Santa Fe, with my friends Mac and Alan, I began exploring the City Different. This excerpt from “In Search of America” recounts my first meetings with artist Tommy Macaione. El Differente had a painting propped in his window, an intense landscape reminiscent of Van Gogh. A stench filled the room. Tommy’s clothes were covered with dog hair. His bed was covered with dog hair, the sheets and cover balled together. Empty dog food cans with bits of decayed meat lay on the floor next to dog turds. There were wet spots and stains where his dogs had peed. Tommy had the title “El Differente” legally affixed to his name. And different he was. He was in his mid-fifties with a long unkempt beard, hideous breath, and hair that shot out in all directions. He was missing several teeth; those he had were brown and yellow. His eyes watered and he spoke frantically, in a rush. “Sure we do,” Alan said. Tommy sat up front with Alan. His smell sickened me. Mac and I rolled down our windows but the rush of air could not eliminate his odor. We drove to a grocery store where Tommy walked to the meat department and returned with large bags filled with bones and meat scraps. Meanwhile, I bought a box of spaghetti, several cans of tomato sauce, Italian sausage, two loaves of bread, and a can of soup. “This ought to hold you for a while,” I told him. He cried and hugged me. I was happy for him and envious of his intensity and dedication and lack of inhibition, but his sentimentality embarrassed me. That night Alan brought him to the dining room, a large hall with balconies and clean light wood tables. The hall was clean, spare, modern. Tommy wore a torn corduroy coat with bulging pockets, baggy pants thinning at the knees, and old cracked shoes with knotted laces. With his wild hair and unkempt beard Tommy looked as out of place as anyone could. But we were proud of our find; after all, we were mingling with the townspeople. That struck me as the big gap between us and the other students: they had little to do with the town. Their interests were in the program, themselves, and a handful of friends. We, on the other hand, lived only partly for St. John’s. You might say the books were for us a jumping off point, a different way of exploring the world, a kind of background to it. The real thing was life, people. “God bless you boys, God bless you,” Tommy kept saying. “Have you always made your living as a painter?” I asked. His fingers were greasy from picking up food with his hands. When bits of meat and vegetables became entangled in his beard, he did not notice. We had Tommy to dinner several more times. For fifteen years Tommy had starved in Santa Fe. Whenever things got especially tough he took out a large ad in The Santa Fe New Mexican—the town paper—pleading for help. He traded paintings for the ads. Now he thought his fortunes were changing. He thought that with a show at St. John’s he would begin to attract wealthy buyers. He wrote prices of three and five hundred dollars on small cards in a scrawl and posted them next to the paintings. Then he scratched out those prices and scribbled in higher ones. For days afterwards we spent hours with Tommy in Mac’s room before a tape recorder as he told us his life story and his theories of art. He wrote huge summaries of these in his large hand on greasy papers. All this was for a biography and artist’s statement, which we were to type up and photocopy and put in a stack in the gallery. We never wrote the biography or the statement. Tommy kept walking or hitchhiking up to St. John’s to see the show. Benevolence and gratitude changed to indignation. He railed at us. 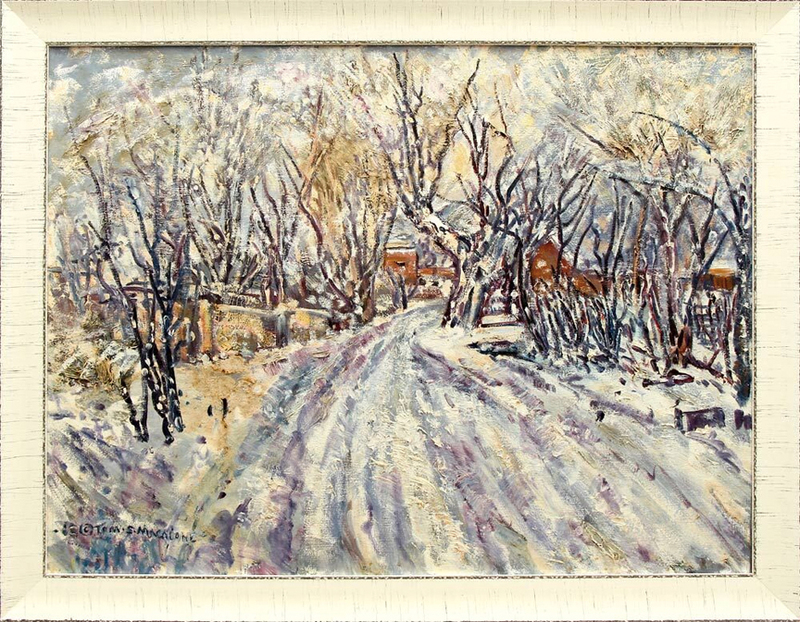 Tommy painted outdoors around Santa Fe in all weather. I remember his large paintings of hollyhocks that grew in profusion along Santa Fe sidewalks. Tommy was most interested in flowers, shrubs, and bushes, sometimes set against houses. In winter he wore several corduroy jackets and torn trousers, painting outside on the bitterest days. I saw him painting one evening at dusk to catch the last of the flowers before the autumn frost. 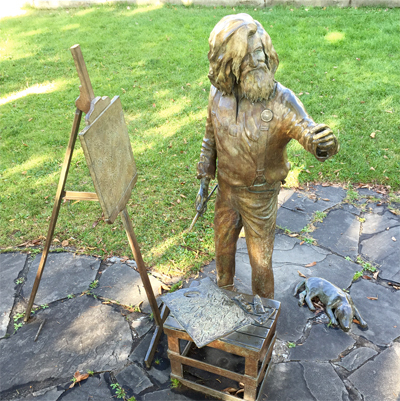 When Tommy was not painting or begging scraps for his dogs, he would walk all five of his pets, getting the dogs and himself entangled as they dragged him across Santa Fe.